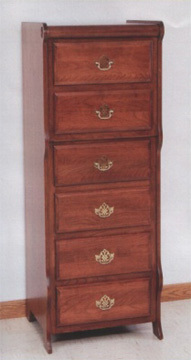 Take a look at our beautiful Amish crafted sleigh style lingerie chest. Made of solid cherry, and designed to be a perfect match to our raised panel sleigh bed, and the rest of our sleigh style bedroom furniture. You will find the depth of this six drawer chest to be the same as the rest of our sleigh style dressers and chests, unless you opt for the smaller night stand, so no matter how you arrange your furniture, everything will come out even. Of course, even though the Amish don’t have televisions in their own bedrooms, they made the lingerie chest the perfect height for your bedroom TV!